Despite what analysts and pundits may say, if you want to get to the root of an issue, there is one simple rule…follow the money. In taking that track, more truth and transparency will be revealed than we might ever imagine. 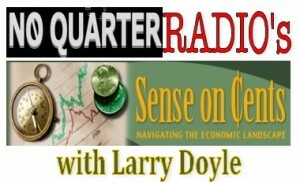 To that end, No Quarter Radio’s Sense on Cents with Larry Doyle welcomes Allan Dodds Frank who perhaps more than any other investigative reporter and journalist has been ‘following the money’ for the last 40 years. Who is Allan Dodds Frank? He is currently the President of the Overseas Press Club of America and has been on the cutting edge of almost every major financial scandal of our lifetime. Allan Dodds Frank is a contributor to The Daily Beast, the website founded by Tina Brown. He has been a television correspondent for ABC News, CNN and Bloomberg. Frank has been an Overseas Press Club member since 1985, most recently served as second vice president and previously OPC treasurer, governor, chairman of the OPC Awards Committee and President of the Overseas Press Club Foundation, where he serves on the board and executive committee. Developing the OPC as one of the leading forums and meeting places for journalists continues to be his top priority. He would like to expand the OPC’s reach among younger journalists, especially those committed to international reporting. He also strongly supports the OPC’s embrace of the Internet as a way to enrich and enhance its role in defending reporters and freedom of the press. His career includes reporting for the Anchorage Daily News, The Washington Star, Forbes, ABC News, CNN and Bloomberg. His specialties include reporting on complex white-collar crime and terrorism. Among his awards: the Gerald Loeb Award for the best Financial Reporting on television and Emmys for reporting on the financing of terrorism and for exposing the degree to which presidential candidate Ross Perot relied on taxpayer funding to build an airport in Fort Worth, Texas. Frank also has won newspaper guild and Alaska Press Club awards for outstanding reporting at The Washington Star and the Anchorage Daily News. What drives the men who engage in financial frauds? Where does the money come from that funds international terrorism? How has Washington fought these crimes? How has Washington facilitated these crimes? How has white collar crime grown over the years? What has changed? What remains the same? Please join me on BlogTalkRadio this Sunday evening October 25th at 8pm EDT as we address these questions and so much more with the Emmy-award winning investigative reporter and journalist Allan Dodds Frank.